Valves are rhomboid with moderately rounded, protracted apices. The valve margins are moderately undulate. The longitudinal ribs and raphe are moderately curved. The ribs are moderately constricted at the central nodule. Wavy longitudinal striae are present. The striae are parallel at the valve center and transition to slightly convergent well before the apices. The longitudinal ribs and helictoglossae fuse to form a relatively small porte-crayon. The stria density range of specimens shown here from Utah and Oregon is slightly higher than that recorded in the original description. The nature of the striae at the apices of F. quadrisinuata is unclear from the literature. 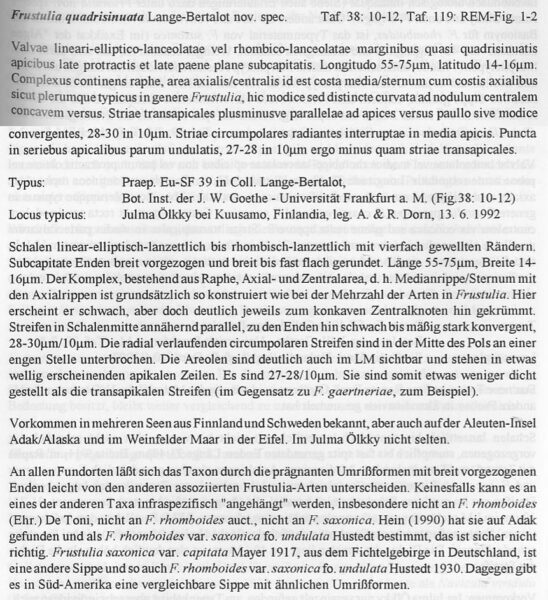 In the original description (Lange-Bertalot and Metzeltin 1996, pp. 59-60) the striae are characterized as interrupted at the apices. In later observations, Lange-Bertalot (2001, p. 171) the striae are said to circumradiate the apices. 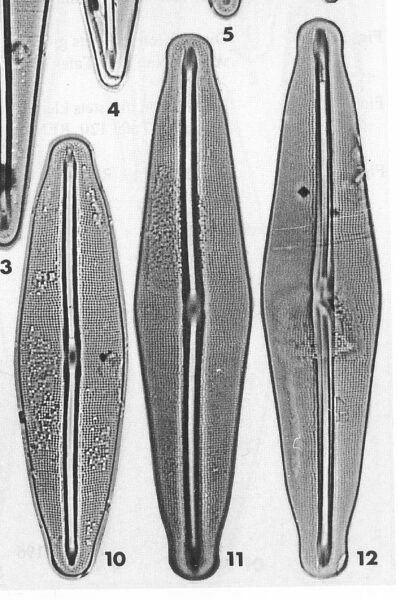 Original light micrographs suggest that the character is variable (Lange-Bertalot and Metzetin 1996, pl. 38, figs 10-12), but Lange-Bertalot does not comment on the discrepancy between the descriptions and figures. Our specimens from Utah and Oregon exhibit show variability of the striae at the apices. Pishkun Reservoir, Teton Co., Montana (U of Colorado Kociolek Collection, COLO#2383) has a population of Frustulia that is morphologically similar to F. quadrisinuata. 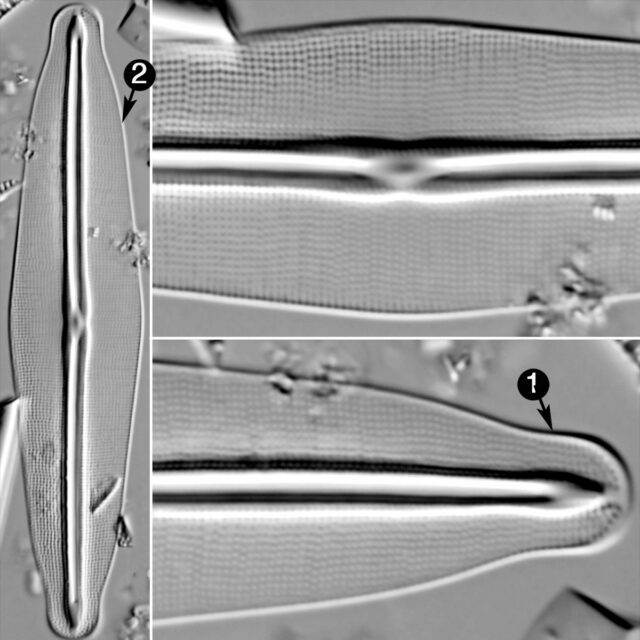 The valves are nearly identical, except that they are 1-2 µm more narrow and all specimens were observed to have interrupted striae at the apices. Further investigation will be necessary to determine whether the population from Montana represents a separate species from those in Utah and Oregon. The valve apices are protracted and moderately rounded. The valve margins are moderately undulate.